With their small plates format menu there’s bound to be hit and misses - the worst offenders the meat-based offerings. 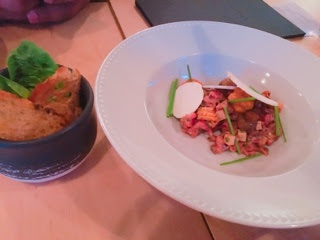 The beef tartare ($14) was flavourless and mushy; the dish certainly could use something crunchy and zippy like chopped pickles to give it bite. 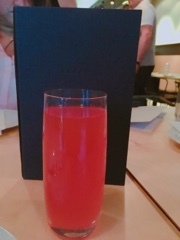 The presentation could also be improved: if it weren’t for the radish slices and snippets of chives, the bowl of loosely cubed meat would feel like eating Alpo. The pork shoulder ($14) was better, the meat tender and juicy, pairing well with the mustard. 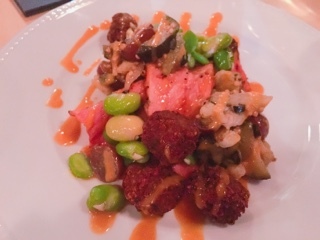 Even the edamame beans were fine – adding a bright splash of green and crunch. It was the sweet grapes and dry mealy falafels mixed into everything that threw me off, it simply didn’t work together. 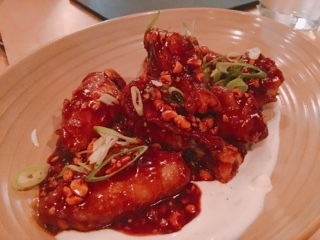 Of all the meat dishes, the chicken wings ($12) were best, smothered in a sweet and sour glaze with crunchy peanuts and scallions for interest. They’re good, but hardly inventive, and rather salty so you’ll want these served last or it’ll take away from the other dishes. So, all the carnivore based selections were passable. It’s all right - Montreal already has so many restaurants dedicated to beef and pork that Cadet can focus on everything else. 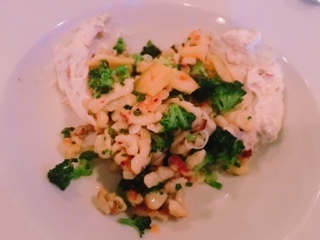 The broccoli ($10) was fantastic: small roasted florets mixed with crispy pan fried speatzle and smooth tangy lebenah. Everything from the textures and flavours worked together so nicely; even the bits of pistachio threw in for crunch. 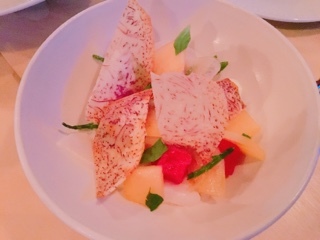 Incorporating a light jalapeno yogurt and sweet melons, the scallop ceviche’s ($18) flavours were well balanced and refreshing. I liked that the ceviche didn’t rely on the typical lime juice, which can overpower delicate seafood and changes the scallop’s texture. 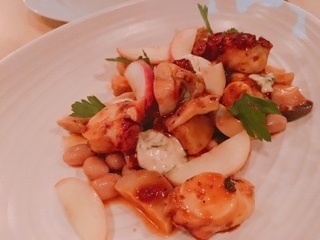 In fact, the dish was closer to sashimi than ceviche, the scallops remaining soft like silken tofu. Soft and meaty, the cubes of octopus ($17) paired perfectly with the earthy king oysters mushroom. Between the octopus, mushrooms and the soft plump romano beans, this is a hearty dish that could substitute for a meat one any day. 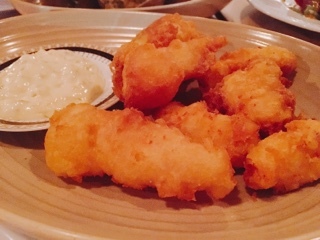 The crispy coating on the fried halibut ($12) was a nice change from all the other saucy dishes. Cadet’s batter was oh so airy, filled with tons of pockets for crunch. What a great vessel for dipping into the creamy gherkin laced tartare sauce. 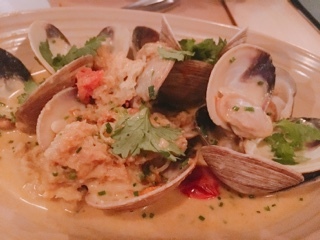 Don’t leave without trying the clams ($14) – for a table of four you’ll need two orders as they’re that good! The light curry was fantastic, full of Thai flavours and not too thick as to overpower the clams. I wish there were more pieces of dried bread thrown into the dish, which soaks up the sauce. Even better, a bowl of steamed rice … *sigh dreamily* ... that would have made the night complete.